International Stretcher Systems (ISS) was established in1983 and is located in Dunnville, Ontario, Canada. 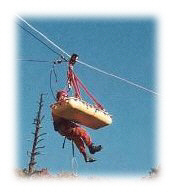 ISS is the largest supplier of stretchers and rescue systems in Canada. Our unique Yellow Jacket Basket Litter is currently used by most high angle rescue teams, fire departments, and industries across Canada and the United States. The Yellow Jacket Basket Litter meets U.S. military specs and is the approved rescue method for leaders in the rescue training field around the world.